Click to enlarge. 1907 – the Arrowhead Hot Springs resort beneath the natural arrowhead rock formation. LOC. 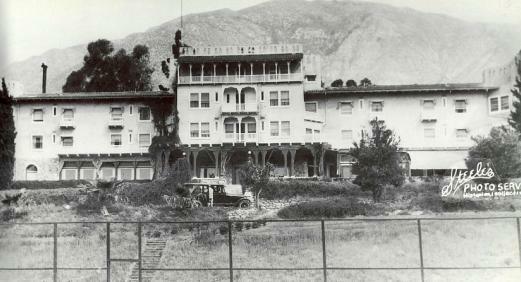 Roscoe Arbuckle, Al St. John, and Buster Keaton must have had special fun making their Comique film Good Night Nurse (1918), leaving their Long Beach studio behind to film certain scenes at the Arrowhead Hot Springs resort 75 miles to the east. Nestled in the foothills north of San Bernardino, beneath the giant arrowhead-shaped outcropping lending the region its name, the resort was a popular tourist attraction with long ties to Hollywood. 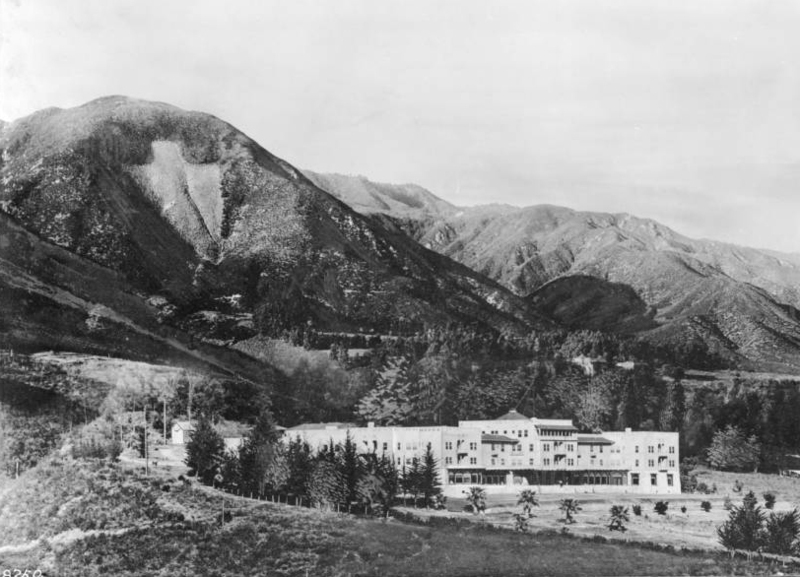 The naturally occurring hot springs were promoted for their curative effects, and the hotel complex appearing in the film was built there in 1905. 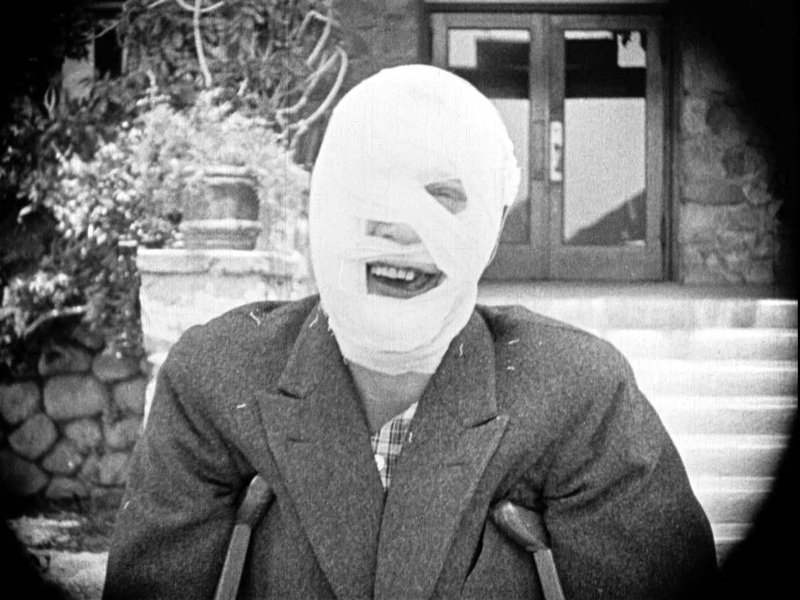 Roscoe portrays a drunken husband, dragged by his frustrated wife to dry out at the No Hope Sanitarium. 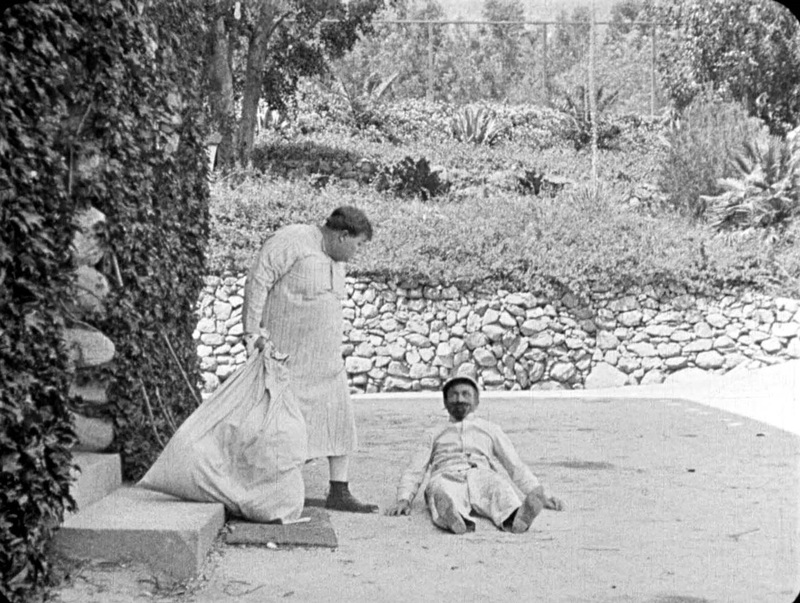 Buster plays Roscoe’s doctor, while Al portrays one of the orderlies, and, as confirmed by renowned silent comedy expert and author Steve Massa, this fully “cured” discharge patient (right) with missing teeth. Eager to escape, Roscoe dresses in drag with a wig and stolen nurse’s outfit, only to run into a suddenly love-struck Keaton, who smiles and flirts shamelessly with Roscoe. Roscoe (above) approaches the resort back entrance. USC Digital Library. Below, the “cured” patient hobbles beside the curved bay of the hotel dining room on the west end of the complex. screen suggests that it was filmed at such a grand and remote locale. While we’re fortunate vintage photos of the hotel are available for study, they were all taken from quite a distance. Thus, a century later, the only detailed views available to us are the brief glimpses appearing in the movie. 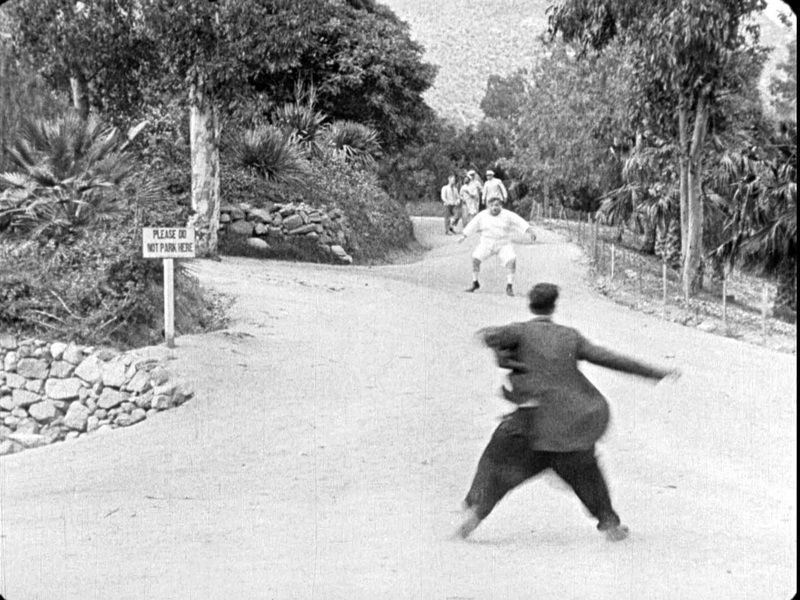 Already well-established when the Comique crew came to film, the resort grew in popularity through the years, providing Hollywood types a place to relax and play and get away from it all. By 1938 a group including Joseph M. Schenck, Constance Bennett, Al Jolson, Darryl Zanuck, and Claudette Colbert were reported to have purchased the resort, only to have the hotel burn to the ground the same year. Famed African-American architect Paul R. Williams designed plans for a new six-story resort, opening in 1939, that continued to attract golden-era stars for many years. Esther Williams was a frequent guest, and Humphrey Bogart filmed High Sierra here in 1941. Elizabeth Taylor spent part of her honeymoon (the first one!) here in 1950 – at the time her father-in-law Conrad Hilton owned the place. But as jet travel made far-flung getaways more appealing, the resort lost favor, eventually shutting down in the 1950s. The hotel was purchased by the Campus Crusade for Christ in 1962. Long shuttered, recent accounts say the property is now available for sale. Click to enlarge. Arbuckle’s crew likely arrived by train. 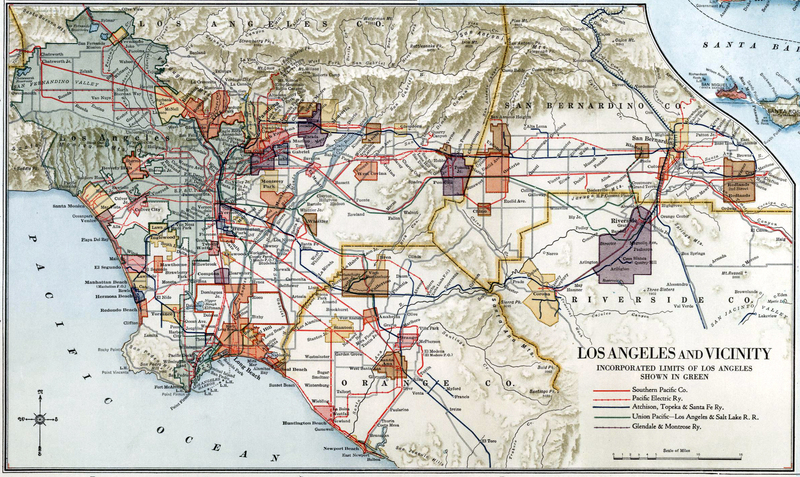 This 1926 railroad map shows the route from the studio in Long Beach, lower left, to the Arrowhead Resort, upper right. It seems like a long way to go for such simple scenes. David Rumsey. 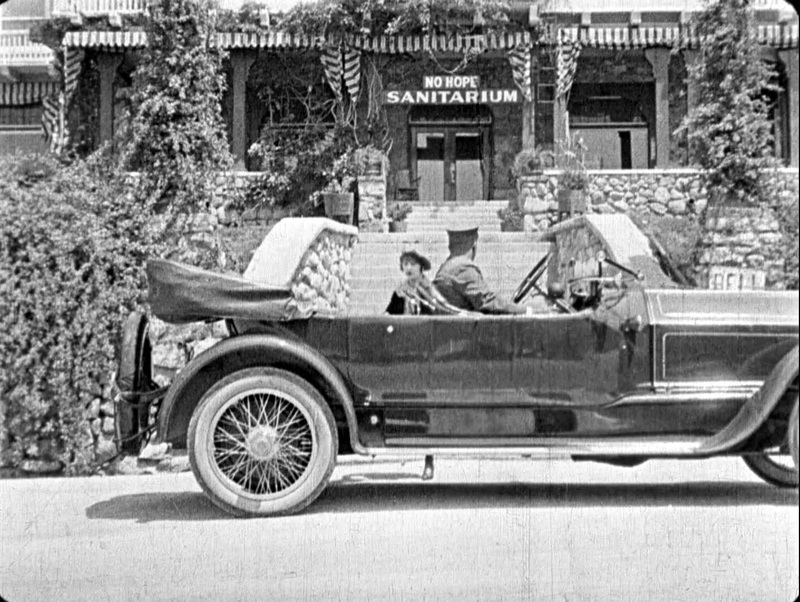 I want to thank Lea Stans, whose informative series of posts about the Arbuckle-Keaton Comique films, including Good Night Nurse, tipped me off about the Arrowhead Resort in the first place. Her Silent-ology blog is dangerous to Google, but always entertaining. 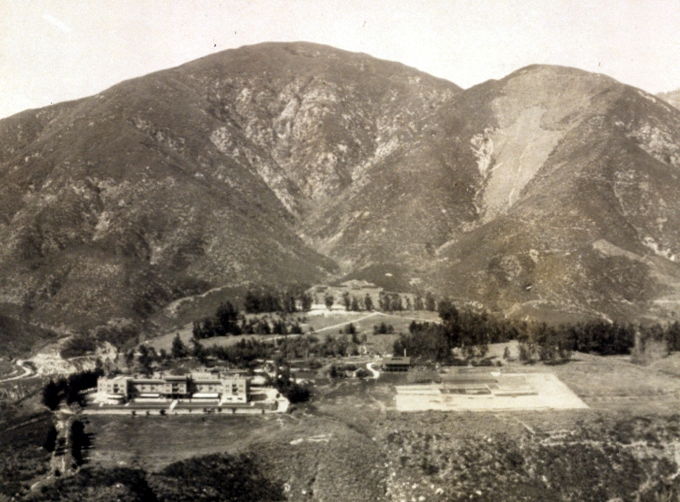 The City of San Bernardino also has a great post about the Arrowhead Resort, including photos of the two hotels built there prior to the 1905 hotel. 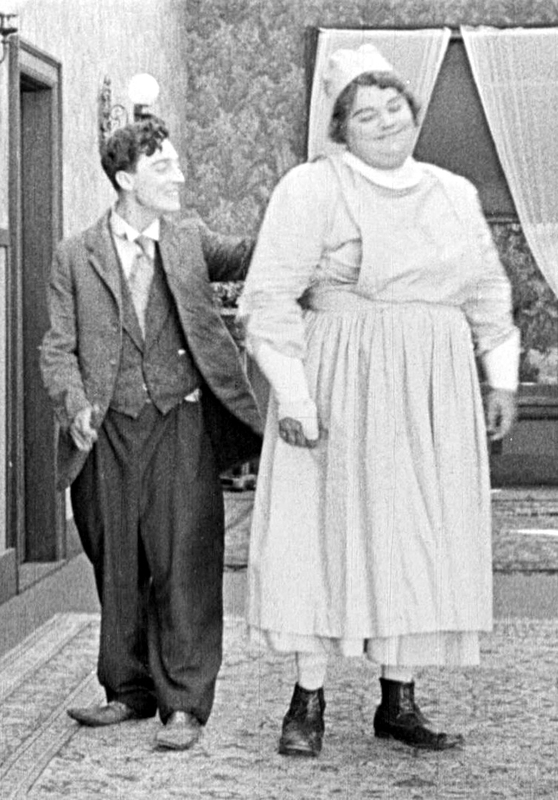 Good Night Nurse: Buster Keaton – The Shorts Collection, from Kino and Lobster Films. If you drag this Google view photo down a bit, you’ll see the arrowhead, blocked by the message box. 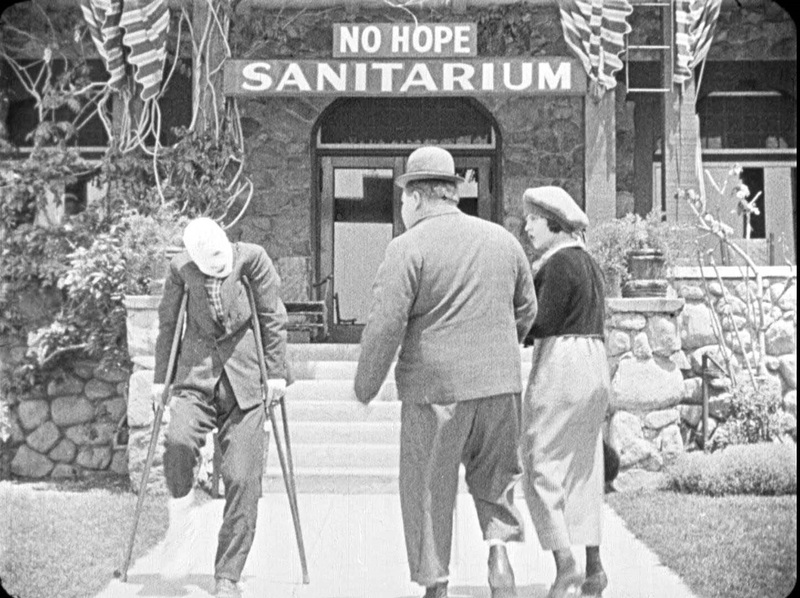 This entry was posted in Buster Keaton, Roscoe Arbuckle and tagged Arrowhead Hot Springs, Arrowhead resort, Buster Keaton, Good Night Nurse, Keaton Locations, Roscoe Arbuckle, Silent Comedies, Silent Movie Locations, Silent Movies, then and now. Bookmark the permalink. So glad my post inspired you to fall down one of these research rabbit holes! 😉 Enlightening information and great photos, as always. I simply love anything about Olde California, and this is just great. Unfortunately, so much of early Hollywood and its environs has gone – even Pickfair has been pulled down! Thanks KG – the resort was about as Olde California as you can get. You can see how completely isolated it was back then, requiring major effort by car or train just to visit the place. I hope something positive will happen to the 1939 resort. During the 1950’s, our family along with many other San Bernardino residents would flock to the Arrowhead Springs Hotel for summer outings because there was a special summer membership program. WE LOVED THE PLACE! Swimming, socializing and water fights were part of the day’s routine. The highest diving board in the area was at Arrowhead Springs Hotel and we dared each other to dive off it. 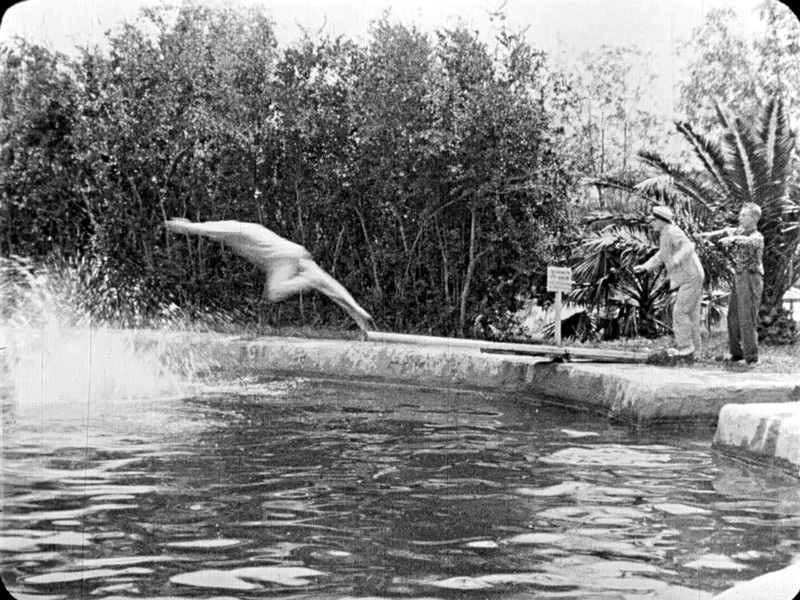 A belly flop would be remembered for a looong time if someone ‘chickened out’ at the last split second by lifting up their heads too much. I relied on diving feet first after experiencing one too many belly flops. One year a forest fire came close to burning the place down and my family, as well as dozens or hundreds? of other people, escaped to the hotel environs to ‘wait out’ the fire. When we finally were allowed to leave, there was evidence everywhere that the fire reached the road leading up to and around the hotel but the structure was left untouched. Great Memories and Glad that San Manuel has bought it. Hope they renovate it properly.